As Airstream lessons go, I guess this one wasn't TOO expensive, it just cost me a weekend, some sleep and about $325 in fuel. I'm still going back and forth, trying to decide if the seller is just lying scum, or is really so stupid that he believed the far-from-true things he said about the trailer. So, I've hatched a plan. As an excuse to start a collection, I decided I'd find a good socializing trailer (bigger, with a gaucho instead of the dinette, preferably rear-bed.) We'd use that one while I'm doing a couple of big projects on the 24, then address any big projects on the bigger trailer, than I'd use the excuse that the 24 is well-suited for state parks and such, and the bigger trailer is nice for social events. My favorite all-around plan is the center-bath, rear-bedroom Argosy (28 or 30) and I started the hunt. One sold before I could get an inspector there, one is in a complicated situation where they've broken the Keeler lock (while locked) before taking interior pictures AND the seller thinks a '77 with the original axles, a 120v dorm fridge and jury-rigged running lights is worth rather more than I think it is. I'm skeptical and into details. I asked a lot of questions. I got a lot more pictures. I couldn't get anyone local to inspect it for a while, so I put together an "Airstream recovery kit" based on the condition I thought it was in and headed off on a 900 mile drive. I took a battery, a new umbilical, bearing grease, tools, jack, jack stands, duct tape and baling wire (literally.) I took a lot of other little crap as well, spare bulbs, fuses, etc. etc. I found a tire shop local to the trailer that would be open late enough on Saturday to get tires if I needed them, even though the seller said "Well, they're not new, but they're just fine, I've traveled all around here with them." I was prepared for most anything but a deceptive seller. I didn't expect a perfect trailer (I have an old Argosy, remember.) I assumed I was going to have to do some working work, new water heater, knew it needed a fridge, figured it would need tires and at least a repack of the bearings to get it home, etc. It's always risky to rely on the seller's pictures, of course, but again I didn't have an inspector. I asked a lot of questions,and got good answers that in many cases were simply not supported by facts. As far as I know, he's still pretending he told the truth and I'm just too picky. He mentioned that he had put in "hardwood floors" so I asked "Is the subfloor in good condition? Any soft areas or holes?" "The floor is good, I there aren't any bad spots, and no leaks to get the floor wet." 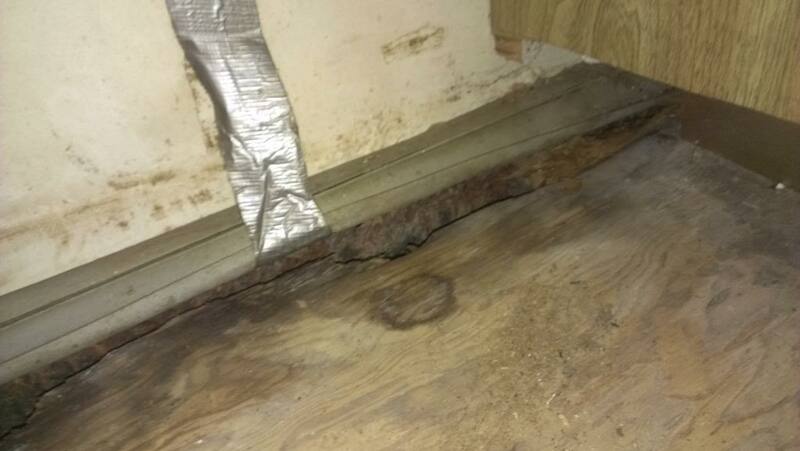 There is a ragged-edged 2-4" wide gap between the subfloor and the shell that is wider than the nightstand, and clearly visible just by opening the nightstand and moving the conveniently-placed expired car license plates that just happened to be covering it. A straight pick held between 2 fingers and a thumb will slip right through the damp, filthy subfloor all around the curbside wheel well (I didn't try the street side, there was too much rodent nest around there). Same story along the curbside skin in the storage space under the armrest of the gaucho. I asked some detailed questions about the plumbing. 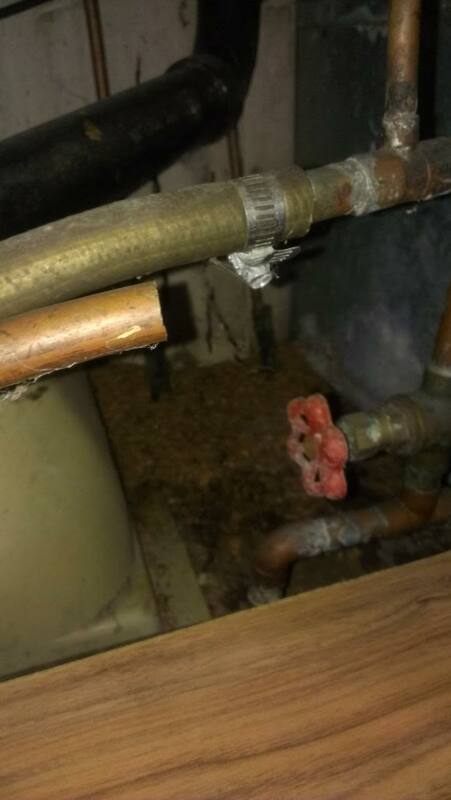 He said it was the old copper plumbing but "it don't leak, and I can't tell if no work has been done on it." I asked if it was all copper and nothing looked newer and he said "I guess it's all original or old, but it don't leak." (He really speaks that way.) Looking into the trailer from the entry door I could see one of the many pieces of GARDEN HOSE that make up a pretty significant fraction of the poor old Argosy's plumbing. 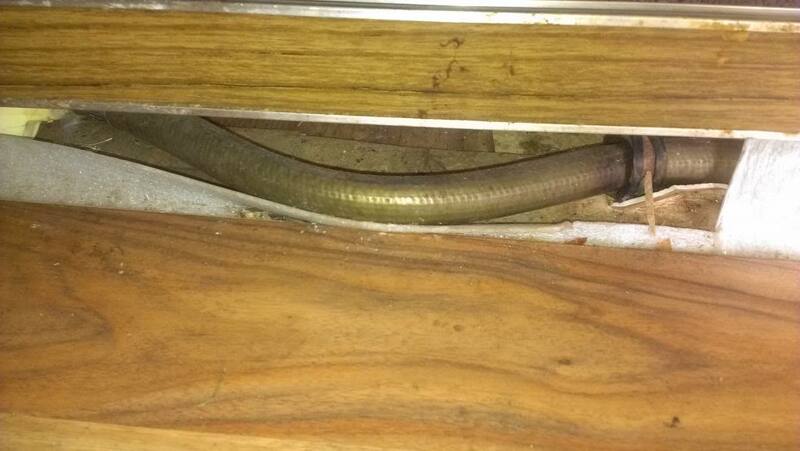 All of the pieces of hose I documented are readily visible by opening cabinet doors. The previous owners supposedly put on Zip-Dee awnings "two or three years before I bought it" (he's owned it less than 3 years.) Not mentioned or shown in photos are that the street-side doesn't match the main awning. The main awning has a dozen or more holes as large as my pinkie or larger. The entry door is cracked all the way through where a full-sized deadbolt has been hacked into it. The door frame was badly mauled during the same procedure. It has a BIG dent in the front that he managed not to show in any pictures. The "older but OK" tires are the oldest Marathons I have ever seen and would probably blow out with a good kick. All of the plumbing vents have crumbled to mostly dust. 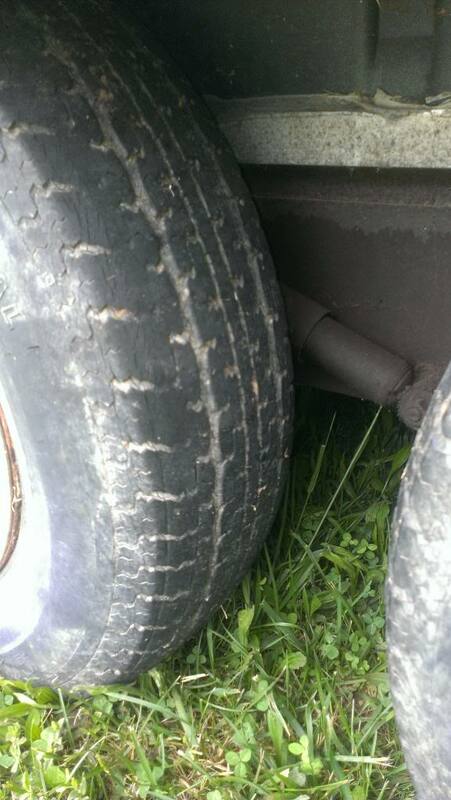 If possible, the sheath for the umbilical was in worse shape than the tires and it ended in corroded bare wires. It had a single propane tank with a non-OPD valve and what looks like the original regulator. A big nasty hole has been cut into one of the interior end caps to mount something that isn't there anymore. Its cosmetic problems were legion, but I didn't care about that, it just was a crappy, beat-down husk. I offered him $2500 for it, thinking that was 2x too much, and I'm glad he didn't take it. P. T. Barnum was right, the seller texted me to crow that someone paid him $4200 the next day. 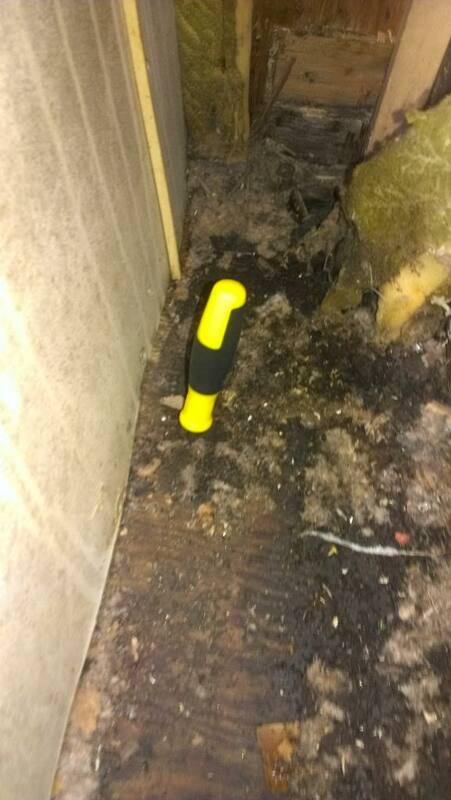 Moral of the story: have someone local inspect it if it's really too far away. Some sellers lie and waste your time. It's a real shame that people will do that kind of thing. You've done a favor to others "on the hunt" for the decent honestly represented Airstream and Argosy units. There's always the temptation that a volunteer inspector may fall under the charm of a perfect used unit, but most won't. When a seller won't give you total all around pictures... the story is usually bull-feathers. We'll probably hear from the new owner (if one actually exists) bemoaning his purchase. OTOH - here's a "scam" I recently pulled - as a potential buyer. I called the nearest local RV store with a decent reputation, asked for and spoke to the service manager and explained that I didn't want to drive 666 miles (just the Mapquest distance was a sign!) on a wild goose chase. He said they'd do the inspection for me for $400. We had a chuckle because he suspected what I might find. Agreed to take complete pictures per MY Specs. I called the seller - who promptly went into a rage and refused to have any further dealings with me. I called the service manager back, told him what happened and we shared another chuckle. I sent him a fruit basket as a thank you. 45 minutes of my time but only $65 for a nice fruit basket. PS Share the seller's name & phone number. We could all call and find out if it's still available. The devil made me say that. I offered him $2500 for it, thinking that was 2x too much, and I'm glad he didn't take it. P. T. Barnum was right, the seller texted me to crow that someone paid him $4200 the next day. More fool you, offering twice what it was worth (no offense meant, just a figure of speech). Should have offered him exactly what you thought it was worth, and not one penny more. The man couldn't possibly have been clueless, so he had to know he was lying through his teeth. No need to be the least bit charitable toward someone like that by offering more than it's worth. If he had sold it to you for $2500, he'd still be crowing over the sale, and probably calling you a sucker behind your back, to boot! re: All-around pictures: He was missing a couple of views in the pictures he sent and I asked for them... The huge dent on the front was not present in the picture from that angle, he had sent an older photo of the front/curbside angle in the initial set, so that was intentional deception. I admit it was foolish to offer the $2500, but I really do want a rear-bed Argosy, and a shell-off would cure most of this trailer's ills. It would just cost a LOT. As I mentioned, he claims to have sold it for $4200 on Sunday, to someone I won't name publicly but I think they posted to AIRForums a couple of times years ago. I found an AIRForums name closely matching the name he mentioned of the buyer. For the moment, it's still listed on Craigslist. ... In retrospect, perhaps the person from Lexington who had posted on AIRForums years ago came to look at it and ran away as well, and he just used that as a name to taunt me that someone had paid lots of $ for the trailer. My neighbor suggested the seller was just messing with me (not the words he used.. ) While thinking about that it occurred to me that the name might just have been someone else who looked at the poor abused old Argosy. Someone else who's curious could call the number on the craigslist ad and see. Karma will bite that seller in the arse, especially for the taunting call-back. That's just classless. I just hope that if someone actually did buy this trailer, they know what they're getting into. Speaking of other RVs, I looked at a Vixen motorhome over the weekend, BMW turbodiesel/5spd stick and all. Luckily for my sanity, my wife said "it's way cool, but you're not getting another RV..."
... In retrospect, perhaps the person from Lexington who had posted on AIRForums years ago came to look at it and ran away as well, and he just used that as a name to taunt me that someone had paid lots of $ for the trailer. If he lied about everything why would you believe he sold it or care. You didn't lose money you saved it. You always have to be prepared to walk away from a deal and never look back. I feel your pain. A similar situation happened to me in Fayetteville AR couple of months ago. 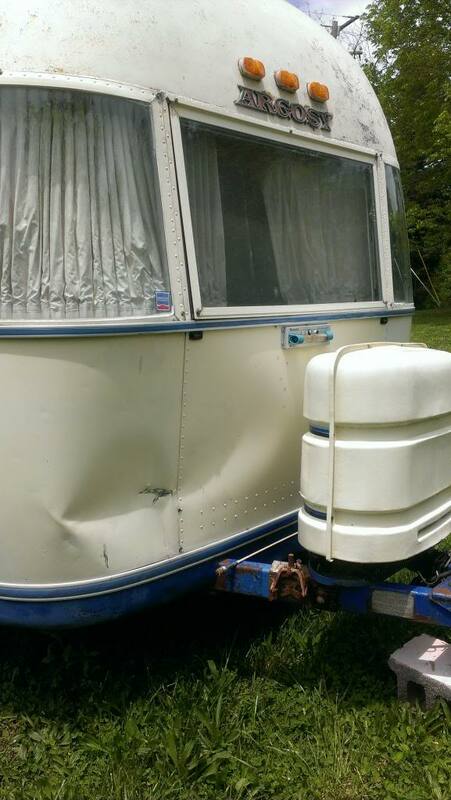 Seller misrepresented an Argosy 22. It truly is "buyer beware". We have been working on our Argosy 24 to get it camp ready. We took out the gaucho, added a dinette, new cabinets, countertops, faucets, new pex, new converter charger and other stuff. If I see what you are looking for in my travels I will let you know. I know I have learned a lot in the last year. Wish I knew then what I know now. Sellers are ignorant and deceptive. Everyone who is an owner becomes a seller at some time. Flippers are the ones who are in it for the quick buck. I lusted after the BMW Vixen when they first came out- they were just the opposite of most motorhomes- small, turbo diesel and a five speed. I would still like to have one, but I really need one of these like I need (another) hole in my head. 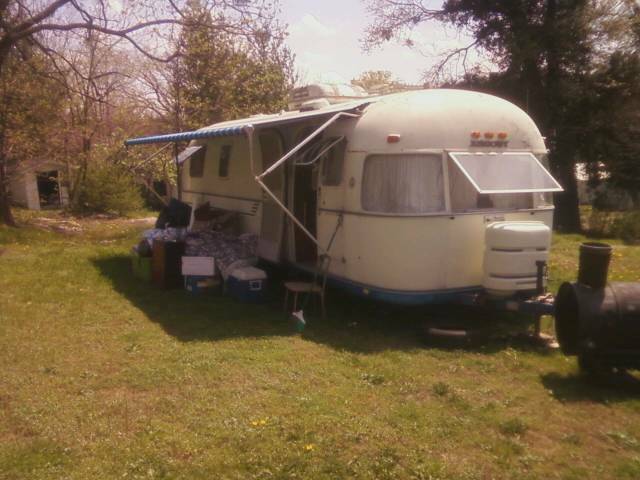 Two vintage Airstreams is enough. I am thankful to have a reliable TV with absolutely no drama. It was a very good read. So sorry about your experience though. Sounds like you had everything covered except dishonesty. Let me know if you find anything within 200 miles of Lynchburg. I will go inspect it for you. Also I will be on the lookout for a 28-30 ft center bath Argosy. My son lives in Fort Worth. I have not been there in a couple of years because our family can not stand his wife- fortunately they are getting a divorce so I will be visiting Fort Worth again. I will give you a holler next time I am there.